Milchbar, close to Zurich Paradeplatz, has been home to a few of Zurich’s welcome known Barista – Nina, Emi, Dario and Matt. Although the Baristas have moved on, the coffee remains consistent. 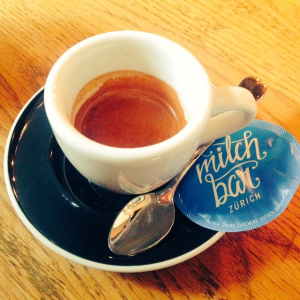 Milchbar hosts coffee from local Zurich roasters, Black and Blaze. I always enjoy a creamy Flatwhite here and espresso of course. Milchbar comes alive during Spring and Summer, with their lovely outdoor seating area. You are also able to grab a fresh sandwich and they have a variety of sweet things to enjoy with your coffee. A great please to enjoy a post work drink too – bring on the warm weather!